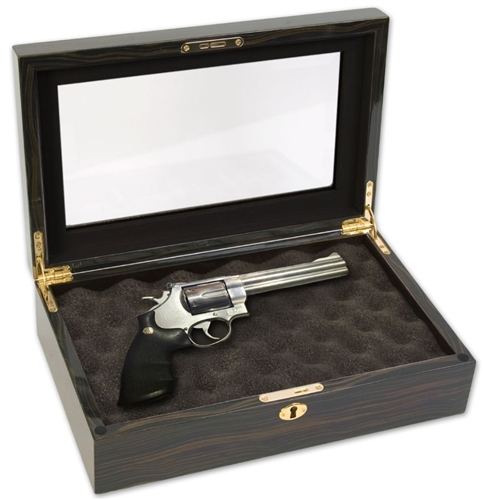 Elegant Display Gun Box in Ebony with high gloss finish. Removable egg foam reveals lined box. Lock & key with plenty of space to remove the magazine. Solid brass hardware, measures 15 1/4" x 8 1/4 x 5 1/2. The perfect gift for him. This luxury wooden gun box is manufactured by Jere Wright Global. 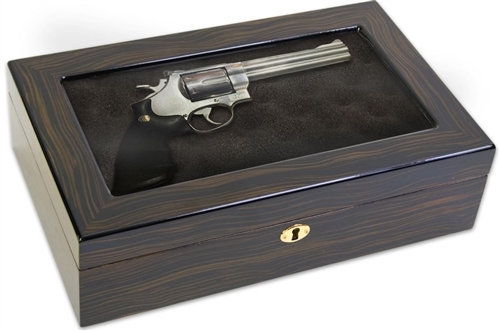 ChasingTreasure.com is an authorized dealer of all Jere Wright Global, Ltd. jewelry boxes and giftware. Red Earring Case. 24 Compartment Jewelry Organizer Storage Box. Mele Travel Collection Cherry Flatware Chest, Solid Hardwood Walnut Burl Jewelry Chest. Fully Locking Classic Leather Jewelry Box with Overnight Jewelry Travel Case. Genuine Leather.